When the tram Network was installed throughout Lanarkshire at the turn of the 1900’s, the long round trip from Hamilton, Uddingston, Bellshill, New Stevenson and Motherwell became a popular excursion on fine evenings or weekends. This was true also for the Wishaw , Hamilton, Blantyre, Glasgow lines too. The Blantyre tram line opened in 1903 and was completely overwhelmed with over 30,000 individuals lining the route expecting to get on the cars on it’s first day alone. Hitching a lift on the tramcar unexpectedly became a great past-time for “something to do” and was allegedly a most excellent venue for courting. In the twilight, as the warmth and light dimmed, especially if you were on the upper deck, the double seats were ideal for “canoodling” or “spooning” your sweetheart. What better way of putting your arm around a person. In later years, it was the back seat of the cinema that proved better suited for warmth (and privacy!). 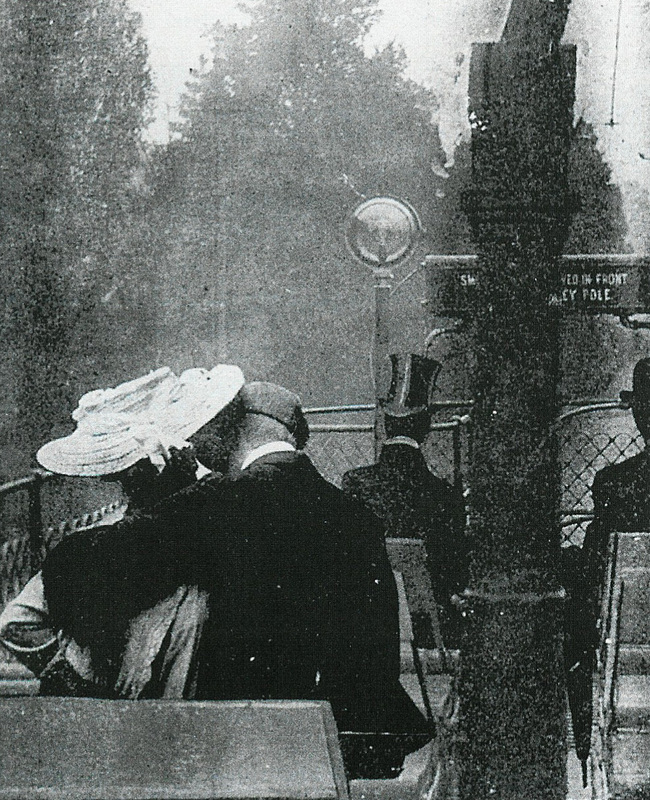 This fantastic Uddingston line photo shows a tramcar in 1913 demonstrating the art of “canoodling”. Interestingly, first class divisions existed on trams in those days, with the sign stating “first class individuals may sit in front of the (electrical) pole”, with 2 rather dapper individuals in those prime front positions offering the best vantage point on the tram.